The Certification for Sustainable Tourism program, is a process through which companies and organizations analyze their operations seeking efficiency, productivity, quality, environmental impacts and client satisfaction. The program seeks the integration of the company’s staff, clients, suppliers and the community. For the year 2018, the Costa Rica Tourism Institute launch the CST 2.0 standard, which fits with the GS TC (Global Sustainable Tourism Council) criteria. The new standard seeks to encourage companies to work under a model of continuous improvement that allows them to innovate in sustainable issues. Travel Excellence’s corporate philosophy reflects our commitment towards conservation and protection of resources, as well as the integration of the communities in tourism activities, which allowed the organization to obtain the CST Elite Level. Obtaining this certification (CST) represents an important competitive advantage for Travel Excellence, which also goes hand in hand with the efforts that the government has been developing in sustainability issues. The Certification for Sustainable Tourism, allows Travel Excellence to execute its daily operation under models that support the local culture and that they benefit the communities; making a responsible use of resources and promoting conservation. Our itineraries seek to promote responsible tourism, where the services and products, that have the Certificate for Sustainable Tourism, are prioritized. The Costa Rican government made a commitment to comply with the goals proposed in the United Nations Framework Convention, on climate change. The results of these efforts are reflected in the Carbon Neutrality Country Program which became official in 2012. The program seeks for organizations to voluntarily report, reduce and compensate the greenhouse gasses emissions of the operation. 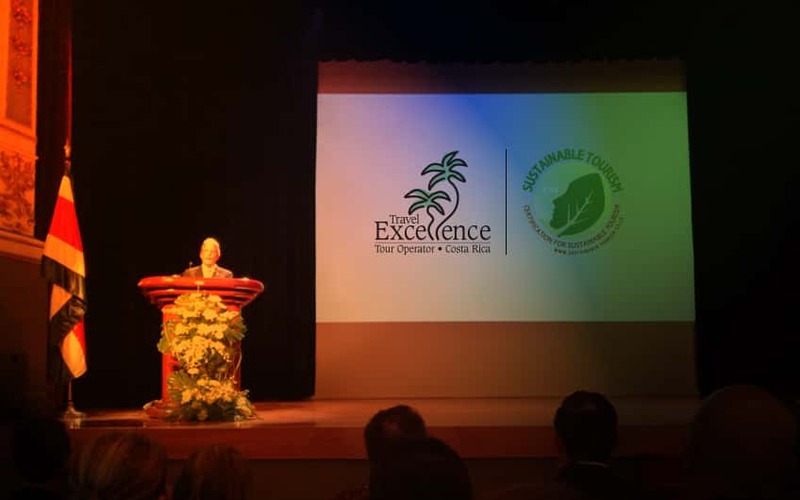 Travel Excellence is considered, in the tourism industry, as a leader company in sustainability issues; thanks to the actions of reducing and compensating carbon emissions, the recycling program, and the constant training of our staff in environmental topics and responsible tourism. The Carbon Neutrality Certification is a distinct stamp for Travel Excellence, which marks the interest of the company in promoting environmental consciousness and taking actions to stop climate change. The company’s carbon neutrality allows tourists that travel with Travel Excellence to leave a positive carbon footprint and contribute to avoid climate change. The Global Ethics Code for tourism is a set of principles that has the objective to maximize the benefits of the sector and minimize the negative consequences for the environment, natural heritage and societies. The code involves all stakeholders of the tourism industry, like governments, companies, communities and tourists that visit the destinations. Travel Excellence has a high commitment towards social responsibility, encouraging respect between the tourism activity and the different societies. 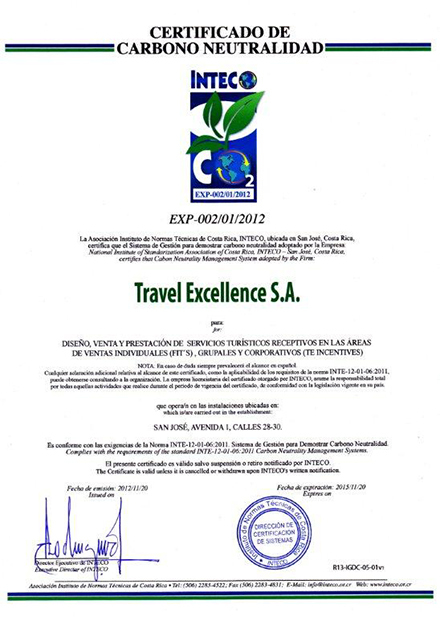 To ratify, Travel Excellence signed the Global Ethics Code in May 2013. With the signing of this code, people traveling with Travel Excellence will take care of the environment, protect the natural heritage, integrate with the local community and receive objective and truthful information about their destination. The Code of Conduct emerges as an initiative of the Global Tourism Organization and ECPAT International, which seeks the commitment of the tourism industry to avoid and sanction the ESCNNA, (Sexual Exploitation of Children and Adolescents) associated to trips and tourisms. A high level service is made up by several aspects, where social responsibility plays an important role, for this reason Travel Excellence is against any activity that seeks the exploitation of minors. This way the company will stay loyal to the code and the ethics by not providing any type of service that involves harmful actions for minors. 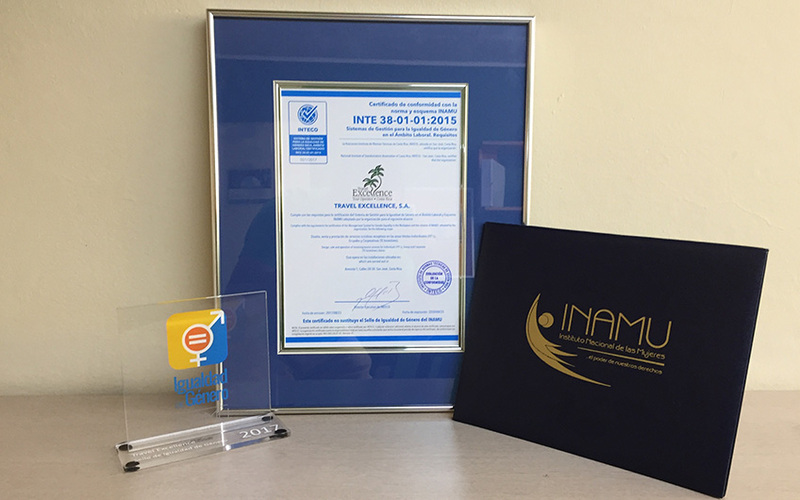 The National Institute of Women established in 2016 the Gender Equality stamp, as an additional recognition for companies who have identified, managed and obtained results in the minimization of gender gaps according to the national INTE G38 standard. The companies who want to obtain this stamp must respect all human rights and the equality between women and men. In addition it is necessary that they develop respectful work environments that generate opportunities and growth for women and men, considering their different interests and necessities. Receiving the certification implies that Travel Excellence has satisfactorily managed their gender gaps with the objective of reducing or eliminating them. Nowadays Travel Excellence counts with recruitment and selection processes that minimize gender bias and discourage any sexual harassment conduct. On the other hand, Travel Excellence is asked to involve their business partners to commit themselves to comply with the current legislation for the protection of working people. An excellent Human Talent management. The correct management of gender equality in Travel Excellence is reflected in a professional environment, resulting in a high quality service.